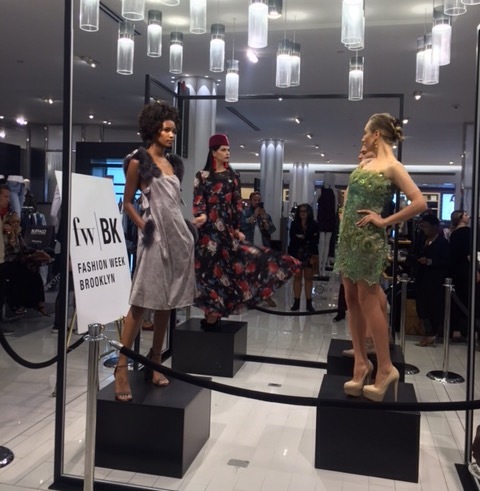 On Wednesday, October 5th, 2016, Macy’s Herald Square celebrated Fashion Week Brooklyn in their New York Herald Square Store’s 4th floor, women’s department. 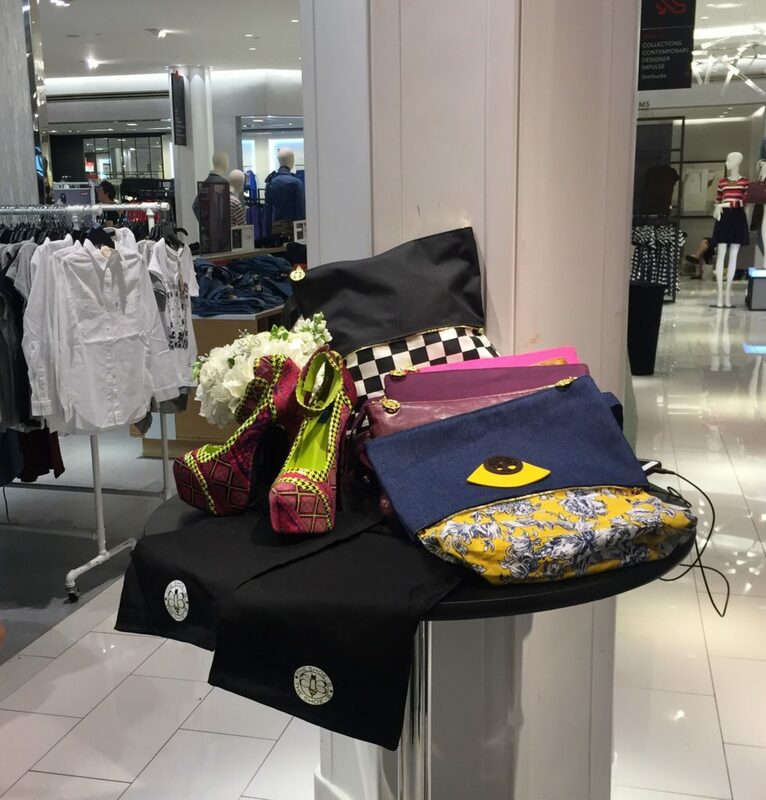 Guests were treated to refreshments and sweet treats by Pauline located in the store’s main floor by fine jewelry. 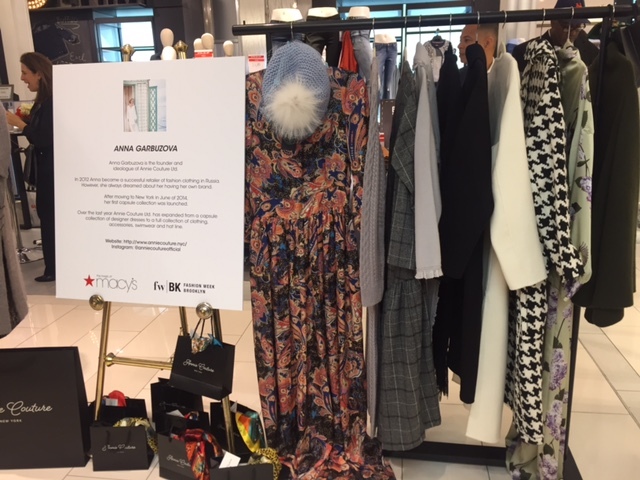 As well as a meet and greet with Fashion Week Brooklyn Award-winning designers such as Annie Couture, Saku NY, Joyce Pilarsky, and Elias Gurrola. Culminating in an exclusive “sneak peek” of their designs which were showcased at the FW/BK 10th Anniversary SS17 Collection Shows on October 1 – 8, 2016. 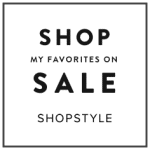 One of Stylehoppings’ favorite designs was the Shoe-B a stylish clutch and a shoe bag. In its clutch form, you can carry your personal items and a pair of flats. When you’re ready to change out of your heels, The Shoe-B transforms and expands to fit up to a size 13″ stiletto shoe. It is available in canvas, denim, faux leather, and leather. Leather jewelry on display by Amber Poitier dedicated to providing women with effortless and fun statement fashion with a modern edge. 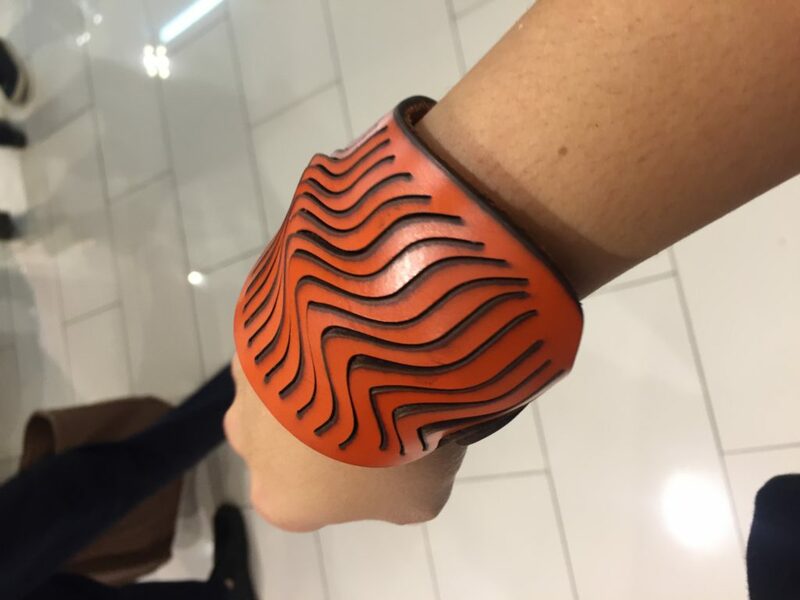 Nature is Amber Poitier biggest inspiration when it comes to choosing their jewelry colors, materials, and collections, Amber Poitier’s team takes the time to think about the materials that will touch your body. We work with wood, metals, leather, Lucite and semi-precious stones. During the meet and greet with the designers, Anna Garbuzova, the founder and ideologue of Annie Couture Ltd. explained to stylehopping that over the last year Annie Couture has gone from the strength-to-strength and expanded from a capsule collection of designer dresses to a full collection of clothing, accessories, swimwear and a hat line that Annie Couture’s brand is now showcasing in Macy’s. Another designer, Lissa Koo explained that the motif for “Saku” is the combination of New York City’s chic with the easy breezy West Coast atmosphere. While being a unique, never-seen-before style, “Saku” offers clothes that are ready-to-wear and easily approachable by anyone. In addition, pursuing both sportiness and femininity at the same time, “Saku” showcases silhouette apparel that greatly emphasizes woman’s beauty along with comfortable fabrics that allow easy movement. Joyce Peñas Pilarsky another designer present has been designing dresses, gowns, and fashion accessories for a long time, her aim is to promote Filipino fabrics and other Filipino indigenous materials from different regions in the Philippines such as pineapple, abaca, pearls, natural stones , and other Filipino materials. Joyce believes that every woman deserves to feel beautiful and stunning; wearing her creations makes a woman more confident, fabulous and a head turner. Also, Miami’s 2016 emerging designer, Elias Gurrola was the crowd’s favorite with his designs. Gurrola’s futuristic idea of recycling clothes has shown small imprints in his collection, which demonstrates to the audience how something that is subtle will emerge naturally and can be used fashionably.